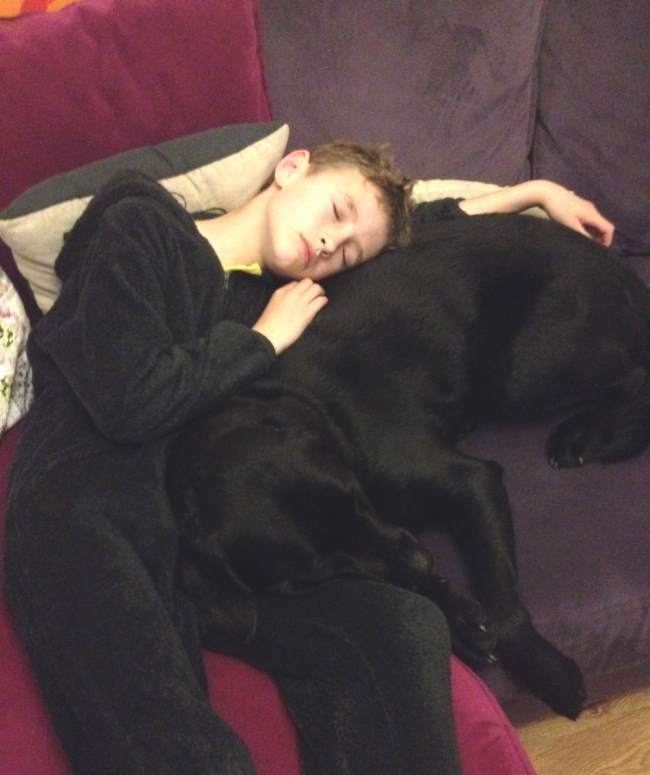 Last year, autism assistance dog Rishi was matched with the Randall family. In a special message to Rishi’s volunteer puppy socialisers, Pat and David Keable, mum Vicky explains how the dog they cared for as a young pup has made an impact on the whole family. Every child needs a friend, for some autistic children this is not as simple as it sounds. The dog that provides this to our son was the little puppy that you took into your home all those months ago. The puppy you loved, supported and trained with such care has become the dog that has made so much difference to our child, me as a parent – the entire family. For that, thank you will never, ever be enough, the work you do is priceless, it has given us an open door to a new world. When our family was matched with Rishi a year ago, we had no idea of the impact he would have on the whole family. Our eldest son Jake has autism spectrum disorder and we also have a younger son Ewan. We had always lived a relatively restricted family life, Jake suffers with very high anxiety which meant that everyday trips into town, meals out and activities as a family had always been difficult. Jake has always been very much alone in his world and any change or difficulty would result in upset and impact profoundly on his younger brother. We are often asked what difference does Rishi make to Jake and your life? This is the hardest question to answer as he has changed every aspect of family life. He walked into our home and became Jake’s best friend, an unconditional friend who is there through the good and bad. On a practical side Rishi has a harness that Jake holds enabling us to go out, we have been to the supermarket, into shopping centres and out for meals. He has opened up a new world for both our sons. We have been able to fulfil the wishes of both Jake and Ewan by visiting a very busy Legoland, watching Leicester Tigers and even attending a wedding in London. Rishi gives more than just practical help; the support he has given us emotionally is beyond measure. Jake will say on a daily basis ‘’I need Rishi’’ and will sit with him stroking him until he feels better. Through Rishi’s company, Jake is learning to understand and cope with the world as he sees it. Rishi is also helping to teach Jake about emotion and empathy with others. On tough days, Ewan our younger son also finds things difficult, Rishi comes to sit by him, quietly offering support and has encouraged Jake to realise that others have needs too. For me personally, Rishi is also my companion – when the boys are at school there is no better way to have some time out than walking with your faithful friend by your side. It is a year since Rishi came into our lives and so much has changed. Thanks to the wonderful trainers at Dogs for Good but also the amazing couple, David and Pat, who volunteered to look after our beautiful dog for the first year of its life, dedicating their home, time and love to creating the most special dog we could have wished for. Thanks to all Dogs for Good volunteer puppy socialisers for the life-changing devotion that they give to each of our young pups to enable them to become amazing assistance dogs. Without you, we could not do what we do. Find out how you could help us change lives by becoming a puppy socialiser.